It is my great pleasure to address the Budapest Water Summit today. I would like to thank the Government and people of Hungary for hosting this Summit, and for their leadership in raising awareness and mobilizing action on the vital issue of water. As we meet, nearly 1 billion people around the world do not have access to safe water, and more than a quarter of world’s population lacks access to basic sanitation. This is a major global challenge. It is a human rights issue, a development issue, and has the potential to become a peace and security issue. Each day, hundreds of children are dying needlessly from preventable diseases resulting from poor sanitation. Women and girls without access to safe toilets and latrines are being forced to practice open defecation, which is impacting their health and dignity, and exposing them to sexual violence and insecurity. In Sub-Saharan Africa, around 40 per cent of the population lives without clean and safe drinking water. And many Small Island Developing States, including Fiji where I am from, face serious freshwater shortages due to water storage capacity constraints and other factors such as the drought that stressed much of Micronesia in recent times. Despite relatively high rainfall, countries such as these often become dependent on non-renewable groundwater sources which are highly vulnerable to seawater contamination. A growing number of countries and regions around the world are experiencing worsening water stress. The OECD currently estimates that between 2000 and 2050 global demand for water will increase by around 55 percent, but it also warns that this figure could become much higher due to rapid population growth, urbanisation and industrialisation, poor agricultural practices, water waste, weak governance, climate change, and catastrophic weather events. As water resources become scarcer, it is expected that tensions over access to water could intensify at both national and international levels. Around the world, 40 per cent of the world’s population live in one of the more than 260 rivers and lake basins that are shared by two or more countries. Despite the alarming nature of these projections, improving people’s access to water and sanitation has already proven to be possible. Under the Millennium Development Goals, the target of halving the proportion of people without access to safe drinking water around the world was reached, and in recent years the UN General Assembly gave recognition to the human right to water and sanitation. Despite this progress it is clear that far more needs to be done. The good news is that the 2030 Agenda for Sustainable Development, the Addis Ababa Action Agenda, and the Paris Agreement, provide us with a universal masterplan to transform our world for the better. If implemented efficiently, effectively and at scale, we will eradicate extreme poverty, build peaceful and inclusive societies, advance gender equality, combat climate change, and protect our natural environment. Under our universally agreed masterplan, we will also provide for universal and equitable access to safe and affordable drinking water, increase the efficient use of water, and restore water-related ecosystems. Indeed, the 2030 Agenda was premised on the recognition of the central importance of water to sustainable development – both as a Goal in itself (SDG6 of the 2030 Agenda), and as fundamental to achieving all the other SDGs. As part of our efforts to achieve water and sanitation-related SDGs, a number of complementary actions should be pursued. Firstly, Governments need to include water and sanitation-related issues in national development planning and budget processes, including for education and awareness-raising efforts to drive more sustainable water use and to address waste. High water-use sectors, including energy, agriculture, and industry should be involved in developing sustainable plans and policies, and to reconcile their demands with the needs of growing populations. Secondly, the provision of adequate sanitation and toilets in all homes and public spaces – including workplaces and schools – must be prioritized. Such efforts are instrumental to preventing diseases, and enabling women and girls to access education and economic opportunities, as well as to driving political participation, civic engagement and economic growth. Thirdly, more effective, efficient and transparent governance systems can help to drive innovation in water-resource management, reform the use of water in agriculture, and mobilise investment in relevant technologies, including desalinisation of sea-water. And finally, progressively addressing trans-boundary water issues will help promote regional peace and security in the long-run. Cooperation between States to establish frameworks on the use, management, cost and benefit-sharing of water resources, must be pursued within a spirit of mutuality. Governments, the UN system, civil society, private sector, and local authorities need to work together to address water and sanitation-issues, including by building on lessons learned, and through reinvigorated partnerships. 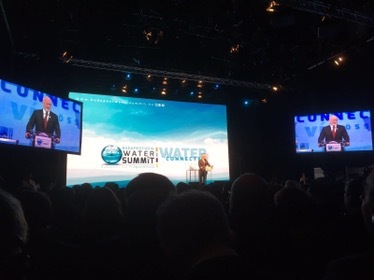 The Budapest Water Summit offers a timely opportunity to drive global advocacy, build collective action, and mobilize increased public and private financial support for water and sanitation-related issues. In doing so, it is critical we all bear in mind the importance of investing in water and sanitation for driving forward the implementation on all 17 of the SDGs. The interlinked nature of global efforts to reverse the cycle of decline in which the Ocean is currently caught, and to sustainably manage water and sanitation for all, could not be more clear. The Ocean sustains us with the basic elements of life, producing half of the oxygen in the air we breathe, and serving as an essential part of the water cycle that provides the water we drink. I therefore encourage all of you to prepare and to participate in the Ocean Conference to be held 5 – 9 June next year, at UN Headquarters in New York. The Conference will bring together high-level stakeholders from across government, the UN-system, international finance institutions, business and industry, civil society, and the scientific and academic communities, in order to mobilize action to save our Ocean’s health. Broad cross-sector engagement will be critical to harnessing the political will, resources, knowledge and strategies needed to drive this work forward, and I look forward to your engagement at this week-long conference. If we are to leave our children, grandchildren and future generations with a world of opportunity, equality, prosperity, security, and peace, we must come together and act now. I wish you all a successful Water Summit.